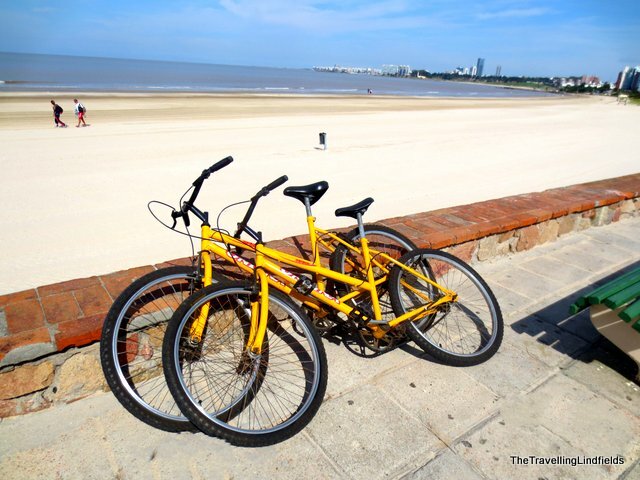 The Rambla in Montevideo, Uruguay, looks like it is made for cycling. It winds around the shore of the River Plate, overlooked on one side by the city skyline and on the other by the vast expanse of the South Atlantic. Technically the Plate may be a river but the delta at Montevideo is so wide it is more ocean than river. We are staying at Carrasco in the suburbs, a posh part of town with expensive houses, boutique hotels and flash restaurants. The Rambla goes almost past our front door and all the way into the city centre. 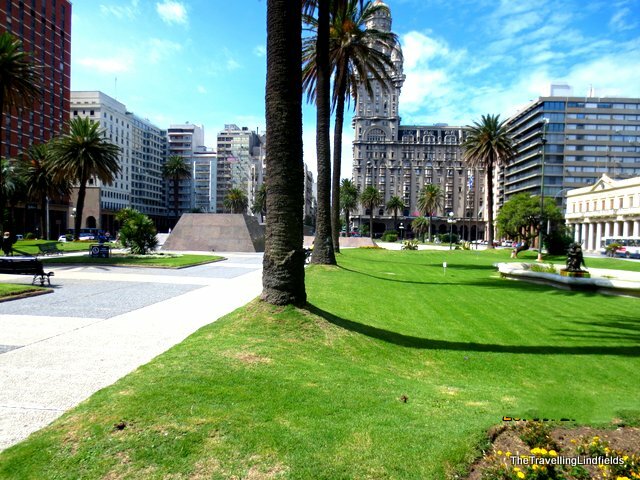 A perfect, traffic free way to see Montevideo - except for one thing. We can't find a bicycle rental shop. Maybe Uruguayans don't ride bicycles. The whole guacho, horse culture is pretty strong so perhaps cycling is just not macho enough. We ask at the hotel desk and our problem is solved. The hotel has bikes. We can have them for as long as we want - free of charge. The free bit should ring our warning bells. It doesn't. We can be very naive. Next morning we don our cycling gear, pack our water bottles and present ourselves at the front desk. The very nice young man leads us underground - into the basement, along corridors and through doorways where we have to duck down to enter. Spiders and cobwebs abound. Finally he locates the bikes, stored with old paint cans and rusty, unrecognisable bits of machinery. All four tyres are flat, the bikes have no gears, no suspension and no padding on the seats. They are very pretty though - a matching yellow pair. Perfect for an easy cruise into town. The helpful young man finds us a bike pump. We put air in the tyres and we are off. They are pretty - but looks can be deceiving. With the wind in our hair and salt spray in our faces the first few kilometres are great. We coast along next to the beach enjoying the sunshine and feeling pleased with ourselves. Then the concrete of the Rambla path turns to flagstones. Bone-jarring rock for mile after mile. We can't enjoy the view because the grooves between the stones are as wide as our tyres. One false turn and we risk being stuck fast and catapulted off the bikes. I don't know why we don't give up. We keep hoping the path will turn back to easy, smooth concrete again. It doesn't. We make it as far as Pittamiglio Castle, about 10 kilometres from our hotel. It's not really a castle but this is Sth America - what did we expect? It is a lot of fun though. The guide book says it was built by an architect and alchemist, Humberto Pittamiglio. I thought an alchemist was someone who turned lead into gold. I imagine the word has lost something in the translation, but it turns out that Humberto was a true eccentric who indeed practised the philosophy of alchemy and littered his castle with the symbols and imagery of ancient arts. Sadly we only see the castle from the outside. There are tours but we are so exhausted we don't have the energy. We fall in a heap in the park across the street and admire the bizarre exterior. The next day we abandon the bikes, (there is only so much punishment out bodies can take), and drive into Plaza Independencia in the heart of the city. The Sunday markets are in full swing and I practise my Spanish on a few unsuspecting stall holders. I don't know why, for the most part Uruguayans speak excellent English. David buys yet another tacky souvenir and I secretly hope customs will confiscate it when we arrive back in Oz. We have another two days in Montevideo. Uruguay has all the history and charm of Europe without the crowds. The buildings are magnificent in a crumbled, decaying sort of way. Statutes of the national hero Admiral Artigas are everywhere. We wander the streets and tick off the sights, stumbling upon unexpected highlights. We turn a corner and join a small crowd following an impromptu Candombe band through the back streets. The performers are brightly dressed playing a booming Afro-Uruguayan rhythm on huge drums. Their enthusiasm for the music is infectious. In the evenings, we gorge ourselves in Parrilla restaurants on the world's best meat, cooked over coals in open barbeques. Vegetables don't seem to exist in this meatatarian society. Tips and trick and things to know. We went in March and had wonderful weather. I enjoyed this but by the title I expected to read about how great it was to bike on the Rambla but it doesn't sound as if even with better bikes it would have been a comfortable experience! I hope to get to Montevideo so if I ever get back to Buenos Aires (still trying to get myself to Antarctica) I'll take that ferry. It was great to cycle along the Rambla but like everything in South America the path was bumpy. I'm glad we didn't get our bikes out when we were there recently! But we did drive a lot of The Rambla on the way in and out of Uruguay to the East. It is lovely along the Rio de la Plata. We would have found the ride easier on better bikes but it would still have been quite tough. I agree with you about the Rio de la Plata being lovely - great place.